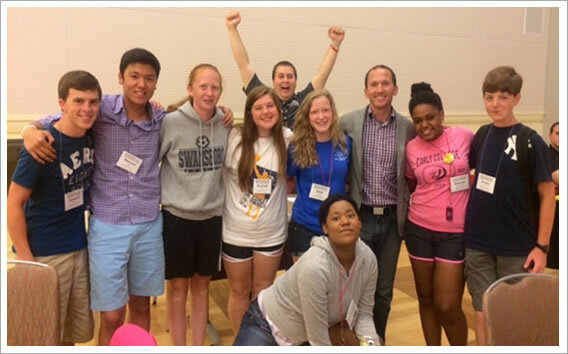 Kevin Snyder is one of the nation’s most engaging professional youth speakers for students and educators. He created “Empower YOUth!” leadership presentations because he wants to ensure every student, educator and parent always has a dream and feels motivated to make a difference. In his entertaining and fun-filled programs, he integrates music, high-energy interaction, captivating videos and inspiring content. As someone who was bullied as a teenager, suffered from depression, battled an eating disorder, was arrested, struggled academically and became a near school dropout on multiple occasions, Kevin’s uplifting messages captivate and connect to audiences at all levels. Presentations incorporate a variety of topics based on your needs and are ideal for students, educators and parents! Talk with him about what you’re looking for. 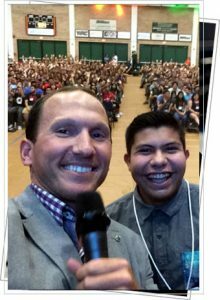 Whether you are seeking a speaker for your school, district or conference, consider utilizing Dr. Kevin Snyder all day! Book him with another school, utilize him for multiple breakouts at a conference, take advantage of him being available all day long for your district, etc.! teachers, staff and even parents! You can only live a dream if you have one first! This presentation shows how it’s possible for anyone, from any age and background, to dream bigger than ever before and achieve their vision. Participants will be taught top leadership principles and how they can enthusiastically apply those concepts within themselves and others. If you’re looking for a high-energy empowerment presentation that will ignite laughter and enthusiasm, then you’ve found it! Participants will not only identify their inner strengths and passions, but also discover how they can take action toward their dream and swiftly persist through challenging adversity. Ideal for students, teachers, district staff and parents! It’s tough when we deal with setbacks in life. There are times when we all want to give up or when we begin to doubt ourselves. These are the moments when we cannot give up, when we need to develop grit, press onward and break through the adversity we are facing. We have incredibly more control than we realize when we become aware that how we handle adversity is a choice – and the only choice that matters. In this ‘interactively FUN’ presentation, participants will learn several key ingredients that, when combined, are the success recipe for becoming UNSTOPPABLE in school, in leadership and in life. Participants will feel empowered about developing an intentional action plan resulting in a resilient mindset that ensures they reach their highest potential! Scientist Charles Darwin had it correct when he stated, “The species who survive are those who best adapt to change.” Neither individuals nor organizations can grow without change, so why then do most of us not welcome change … and some even fear it? In this engaging and entertaining presentation based on Dr. Snyder’s best-selling book “Think Differently,” we’ll discover concepts and strategies that will help us get out of our comfort zone to not only view change positively but also as a catalyst for dynamic growth! All success begins with belief and positive beliefs lead to positive actions. A guarantee is that participants will think differently about change, be prepared to grow their comfort zone and leave feeling empowered to innovate and ride waves of change! Have you ever wondered how some people and organizations achieve amazing success? What do they do differently to obtain extraordinary results? The answer: they follow a process. Contrary to mainstream thought, achievement doesn’t just happen – it’s not an accident. This presentation will share the amazing stories, leadership secrets and strategies from extraordinary leaders! The clues shared in this presentation will transform your leadership style and ability to maximize your success immediately. You will leave this presentation with a deeper understanding of Leadership DNA and what ACTIONS are truly most important to maximize any dream or goal! Understanding Millennials and Gen i! 2015 was a pinnacle year where the Millennials officially became the majority demographic population … and Gen i follows close behind. These two generations comprise our students and children, each carrying unique generational characteristics that can be challenging to comprehend, relate and teach. Understanding how these generational differences impact student engagement, development and education is essential for our future generations. Superintendents, principals, teachers, district personnel and parents – being Baby Boomers, Gen X’ers or older Millennials themselves – must know how to embrace the needs and perspectives of the Millennials and Gen i’s. In this interactive presentation tailored specifically for educators, district personnel and parents, you will learn fascinating best practices, ‘next practices,’ and tangible take-a-ways showing how to leverage unique generational mentalities and expectations. You will understand how the arrival of the most hyper-connected, civic-minded and tech-savvy generation has impacted student development and success. Interested in having Kevin speak at your event?